By Louis Jacobson on Tuesday, May 15th, 2012 at 4:03 p.m.
Mitt Romney's comments at the Consol Energy Center in Pittsburgh have become a point of contention in judging the Republican candidate's views on humans and global warming. Do humans contribute to global warming? There’s been a robust debate over whether Mitt Romney has flip-flopped on this question. In this item, we’ll try to determine whether he has. We’ll start by noting that the Flip-O-Meter rates politicians' consistency on particular topics from No Flip to Full Flop. The meter is not intended to pass judgment on their decisions to change their minds. It’s simply gauging whether they did. Romney’s campaign website is silent on climate change. But in Romney’s 2010 book No Apology: The Case for American Greatness, he wrote that "I believe that climate change is occurring — the reduction in the size of global ice caps is hard to ignore. I also believe that human activity is a contributing factor. I am uncertain how much of the warming, however, is attributable to factors out of our control." "I don't speak for the scientific community, of course. But I believe the world is getting warmer. I can't prove that, but I believe based on what I read that the world is getting warmer. And number two, I believe that humans contribute to that. I don’t know how much our contribution is to that, because I know there have been periods of greater heat and warmth in the past, but I believe that we contribute to that. So I think it's important for us to reduce our emissions of pollutants and greenhouse gases that may well be significant contributors to the climate change and the global warming that you're seeing." Romney added that he opposed the United States unilaterally adopting a cap-and-trade plan if other countries weren’t taking similar steps to reduce greenhouse emissions. A cap-and-trade plan would require industry to pay for their carbon emissions with new permit fees. There would be a limited amount of permits (the "cap"), but companies would be able to buy and sell the permits among themselves (the "trade"). Later, in an Aug. 24, 2011, event in Lebanon, N.H., Romney said, "Do I think the world's getting hotter? Yeah, I don't know that, but I think that it is. I don't know if it's mostly caused by humans. … What I'm not willing to do is spend trillions of dollars on something I don't know the answer to." Romney said, "One, I believe what I said before, I think it's getting warmer. Two, I believe we contribute to it. And three, I don't know by how much -- a lot or a little. And so I am not willing to adopt multi-trillion dollar programs to reduce greenhouse gases in America. They don't call it America warming, they call it global warming." Both the book excerpt and the three New Hampshire comments suggest pretty clearly that Romney sees a role for humans in climate change, though he’s less committal about how large an impact humans are having. But at a campaign event in Pittsburgh, Pa., a few months later, Romney offered a somewhat different perspective. His comments were videotaped and promoted by the liberal advocacy website Think Progress. A voter asked Romney, "What is your position on man-made global warming and would you reject legislation, such as cap and trade, which is based on the idea of man-made global warming?" "My view is that we don’t know what’s causing climate change on this planet. And the idea of spending trillions and trillions of dollars to try to reduce CO2 emissions is not the right course for us. My view with regards to energy policy is pretty straightforward. I want us to become energy secure and independent of the oil cartels. And that means let’s aggressively develop our oil, our gas, our coal, our nuclear power." Much of Romney’s underlying policy proposals -- reducing foreign oil dependence; increasing the use of natural gas and nuclear power; and opposing cap-and-trade -- remained the same in both comments. But this time he left out human activity as a cause of global warming. Rather than saying, as he had in the past, that we don’t know how much of a role humans are playing in climate, Romney said, "We don’t know what’s causing climate change on this planet." 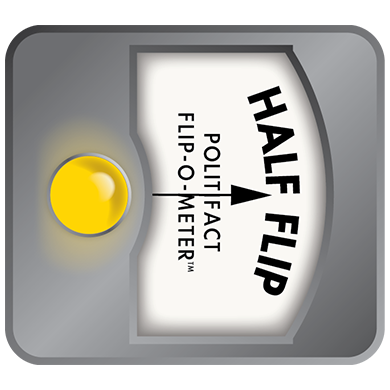 After Romney’s remarks were widely reported, Romney spokeswoman Andrea Saul told the Boston Globe that Romney was not flip-flopping. "This is ridiculous," she said in a statement. "Gov. Romney’s view on climate change has not changed. He believes it’s occurring, and that human activity contributes to it, but he doesn’t know to what extent. He opposes cap and trade, and he refused to sign such a plan when he was governor." We were unable to find any remarks since then about whether he thought human beings contribute to global warming or not. In June 2011, Romney said he believed "the world is getting warmer" and that "humans contribute to that." In October 2011, by contrast, Romney said that "we don’t know what’s causing climate change on this planet." It’s unclear to us whether this was an inadvertent omission or a calculated attempt to say divergent things to different audiences. Because Romney, in our view, is savvy enough to know the difference between suggesting a human role in climate change and leaving it out, we think it’s reasonable to perceive Romney as taking two distinct stances in these two statements. We rate this a Half Flip. Published: Tuesday, May 15th, 2012 at 4:03 p.m.